If you experience a problem with your Olympus digital mirrorless interchangeable lens camera (ILC), you may see an error message. Even though it can be frustrating to see an error message, at least the error message provides a clue as to the problem. Check the status of a lens. This error message usually occurs when the lens is not attached properly. You may need to try removing the lens and attaching it again. Be sure to turn off the camera before reattaching the lens, just to allow the camera to clear the error message. If you're sure the lens is connected properly, make sure the metal connects on the lens are free of grime and particles, so they can make a clean connection with the camera's metal connects. Image cannot be edited. If you're trying to use some of the in-camera editing features on your Olympus PEN camera, and you're trying to work with a photo stored on your memory card that was taken with a different camera, you'll probably see this error message. The Olympus PEN camera usually only can edit its own photos, rather than photos shot with another camera. Use an image editing software package after downloading the photo to your computer instead. Lens is locked. If the lens is retracted but needs to extend, you might see this error message. 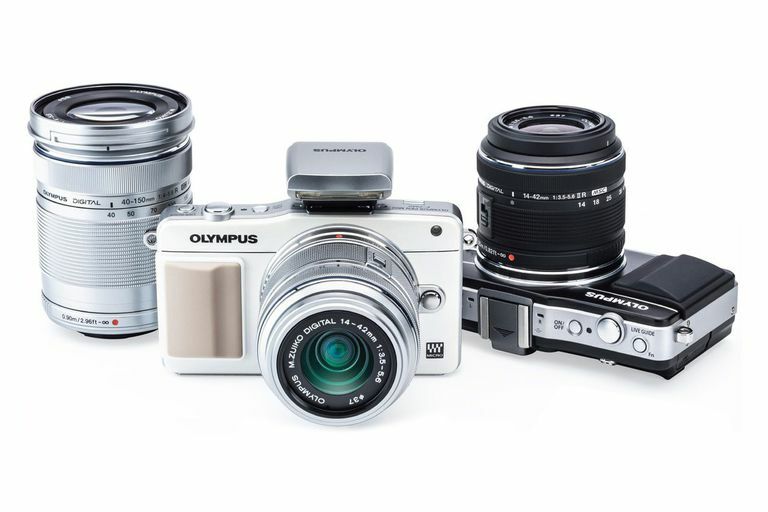 Some Olympus PEN camera zoom lenses have a "lock" switch that allows them to stay in place when not in use. To extend the lens, you must manually turn the zoom ring counter-clockwise. Picture error. This error message sometimes occurs when the memory card is full. You'll have to clear some space on the card. Otherwise, the camera cannot read or display the photo you've selected. Try downloading the photo file to your computer to see whether it's viewable on the computer. If not, the photo file probably is damaged. Slow shutter speed number is blinking. If the shutter speed setting is blinking in the LCD screen, and if you're set to a slow shutter speed, such as 1/60th of a second or less, the subject is underexposed. Use a flash or shoot at a smaller aperture setting. Fast shutter speed number is blinking. If you're set to a fast shutter speed, such as 1/250th of a second or faster, and the shutter speed setting is blinking, the subject is overexposed. You'll need to decrease the ISO sensitivity or increase the aperture setting. Low aperture setting is blinking. If the aperture number is blinking when it's set at a low number, such as F2.8, the subject is too dark. Consider using the flash or increasing the ISO sensitivity. High aperture setting is blinking. If the aperture number is blinking when it's set at a high number, such as F22, the subject is being overexposed. Consider using a faster shutter speed or decreasing the ISO sensitivity.